Natalie spent her life roaming the world with her mother, an international diplomat until one day, she pretended her mother was a spy. Everything changed when Natalie was caught poking in her mother's suitcase. Natalie was dumped in Hollingvale, a sleepy Australian town, to live with her father. She never saw or heard from her mother again. Jump forward several years to Natalie's last final school year. She has a best friend loves art with a passion but she still hasn't recovered from her mother's abandonment. Although she's comfortable enough living with her dad, she can't bring herself to call Hollingvale home. When a stranger from the Bright Futures Foundation talks at school assembly, everything Natalie thought she knew about her life shatters. Within hours, she is running for her life. Welcome to the world of Inductors who glean power from other people's suffering and death, and magical skills based on your quintessence. There's a spy/sorcery school, levitation and mystery at every turn. Throw in a few twists like the world in danger of being coerced into World War Three and a super spy who seems intent on murdering Natalie and you have a rollercoaster of action and intrigue. There are the small questions. 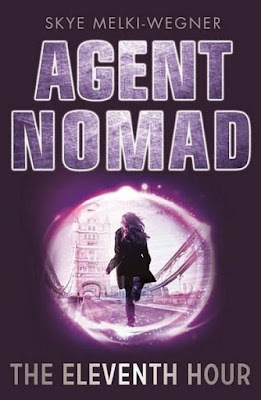 Will agent Nomad, who was once Natalie, ever see her father or best friend again? What will her old school think if she literally disappears off the face of the earth? Is it possible to find home in this weird new world? And there are bigger concerns, like whether the world will be overwhelmed by murderous Inductors. Agent Nomad: The Eleventh Hour, with quirky characters, unspoken secrets and supernatural skills to be learned, is the perfect escape read. As the first book in this new series, Agent Nomad promises many hours of magical espionage danger and fun.